Plans for a lorry park for up to 1,500 trucks are being unveiled by Dover Harbour Board on Thursday. The Board said it would end Operation Stack, where lorries wait on the M20 when port operations are delayed. But environmentalists have said they want other options explored before a lorry park is built on green belt land. Dover Harbour Board has not yet named a site, but it is thought the lorry park, set to cost between £20m and £30m, may be between Farthingloe and Aycliff. 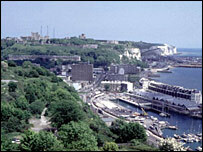 Dover's MP Gwyn Prosser, secretary of the parliamentary all-party Area of Outstanding Natural Beauty (AONB) group, said the Court Wood site was "reasonably low-grade arable land". He said: "I believe we can find a compromise which provides a buffer zone, deals with traffic congestion and yet gives additional payback to our local area with regards to our green sites and our beautiful North Downs." Dover council leader, Cllr Paul Watkins, said residents had been cut off from homes and jobs by lorries in the town. He said: "Businesses suffer, people can't get to and from work, and pollution levels have been increasing. There is no doubt there are major problems." But Steven Dawe, from the Kent Green Party, said there were other options, such as congestion charging, or charging foreign lorries using the port. "I think there would be legitimate concern that once a lorry park was built there may be attempts to make it larger," he added.